It’s no accident that recycling is last. It’s the least desirable option of the three. 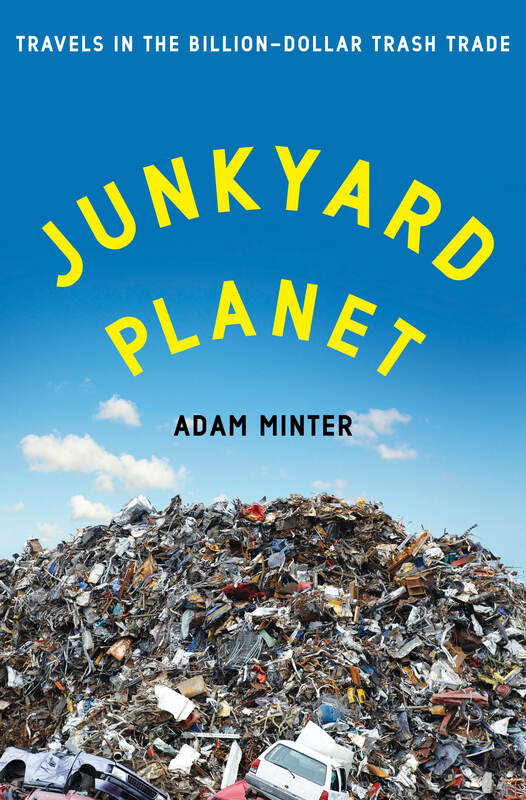 Adam Minter’s Junkyard Plant: Truths in the Billion Dollar Trash Trade sets out to explain why. Adam Minter grew up the son of a junkyard owner specializing in scrap metal, worked for his father while growing up and parlayed that experience into a singular journalism career. He reports on the global recycling industry for numerous trade and general interest publications, covering everything from cardboard and paper to plastic, metal and so-called e-waste. Everyone who considers themselves an environmentalist should read this book. The book starts by taking the reader on a journey from the Christmas trees in American homes to a Chinese recycling facility that separates the copper wire from the plastic insulation of Christmas tree lights. The plastic will go to a nearby factory to be made into slippers and the copper melted down and reused to power the burgeoning Chinese economy. The central theme is how the laws of supply and demand determine how all the materials that developed countries consume and throw away in record amounts wind up feeding the rapidly growing economies of China and other developing countries. Minter tells us to consider what we are really doing when we recycle, as he puts it, “outsourcing the problem.” He points to two studies that show that offering a recycling option where there was none before leads to increased consumption. I was most shocked reading the chapter on Guiyu, the e-waste capital of China and the world. Minter calls it the most polluted place he’s ever visited. What and how computer parts get recycled there depend on the market. Guiyu traders extract five tons of gold per year by dissolving computer chips in acid with little or no worker protection; yet there is also such a high demand for used computer chips by Chinese computer makers that some chips will be extracted by hand and reused. China, and growing countries like it, are the only places where people will do this work; in the United States this waste would be land-filled as no one would be willing to work for the wages. Yet the global trade in scrap ultimately ensures that less raw material is extracted from mines and less waste ends up in a landfill. Minter maintains this is the best possible outcome outside of reducing consumption or re-using. For where is the incentive to reduce consumption or re-use old equipment when we are addicted to having the latest, greatest technology? Do not think that we are “dumping” our e-waste in a foreign country, Minter advises. There is both a market for the cheap labor used to dissemble the electronics, giving Chinese farmers the ability to earn more than what’s required for subsistence and a market for the previous years’ technology that has become obsolete to us in the United States. The Waste Management recycling plant in Houston, TX, where miles of conveyor belts transport the waste from our blue and green bins to the mechanisms that sort all that waste using the laws of physics. The home workshops of “Brass City” in India, where brass, or “honey” as it’s called in the trade, is melted down for reuse by nearby factories that produce the “widgets” of daily life. Being born into the scrap trade, the author clearly loves the diverse groups of people he has made connections with, major and minor players in the global scrap industry. No matter what country they hail from, they are “his people.” The reader will meet a fascinating and down-to-earth cast of characters, from the people who have made fortunes in the business to the lowliest workers sorting through hills of shredded metal.